Faith Radio offers Christ-centered broadcast 24 hours a day, 7 days a week - all without commercials. 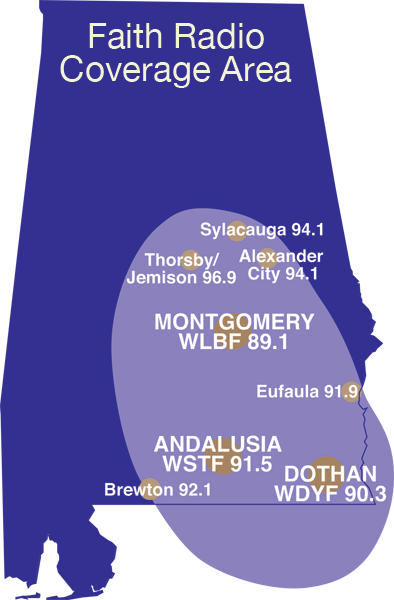 "We Live By Faith" (WLBF) and are supported by the financial gifts of our listeners! Our focus is on the ever-relevant Gospel of Jesus Christ. 2 Timothy 3:16 tells us "All scripture is inspired by God and is useful to reach is what is true and to make us realize what is wrong in our lives. It corrects us when we are wrong and teaches us to do what is right." Listen to the difference you hear on Faith Radio! Tune in and invite God's presence into your life. We are here to help you develop, strengthen and share your faith.